“Come quickly,” our naturalist guide called to my husband Larry and me as we kayaked in sparkling turquoise water off the shore of Santa Fe Island in GalapagosNational Park. “A baby sea lion has just been born,” she gushed. Tour guests in the panga (rubber raft) with the guide had just witnessed the amazing delivery. 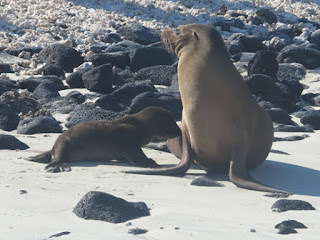 Most islands, including Sombrero Chino, were home to sea lions. 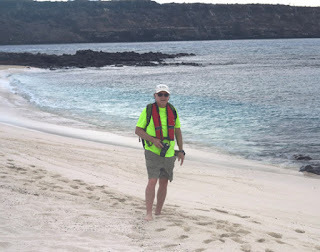 This was the fifth day of our eight-day expedition to explore several islands in the eastern portion of the Galapagos archipelago located 600 miles from the western coast of Ecuador. Wildlife viewing is a highlight of any tour in the Galapagos; and we had seen plenty of land and marine creatures. But observing an actual birth was an unexpected bonus. Blue footed boobies were plentiful on Santa Fe island. We quickly paddled our kayak to the appointed spot and saw the furry baby snuggled under its mother. While we missed the actual emergence witnessed by the others, we still felt lucky to observe the earliest moments of this new life. 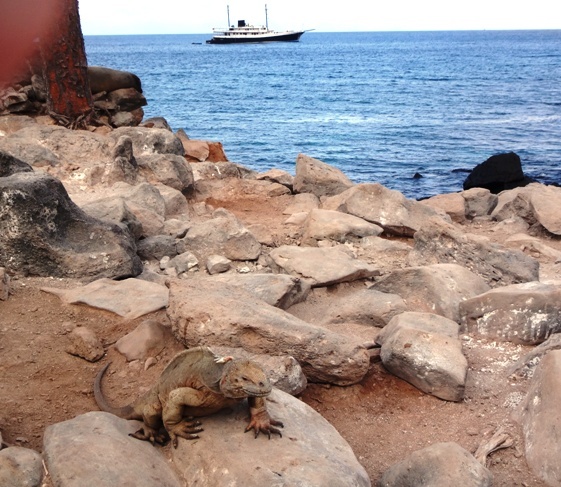 Experiences like this made our Galapagos adventure with International Expeditions a trip to remember. A puffed up frigate hopes to attract a mate. We didn’t really get dirty, although we did get wet and sandy at times during our nature quests. Each day was filled with hiking and snorkeling as the MV Evolution sailed from one island to another, most uninhabited by humans. Instead of people, iguanas, sea lions, fur seals, crabs, turtles—even penguins and flamingoes--populated the sandy beaches and volcanic landscapes over which we trekked. Soft white sand on Mosquera Island, home to hundreds of sea lions. Puffed-up frigate birds, Darwin’s finches, elusive hawks and owls, and boobies (the red-footed and blue-footed varieties) provided entertainment during our twice-daily walks. 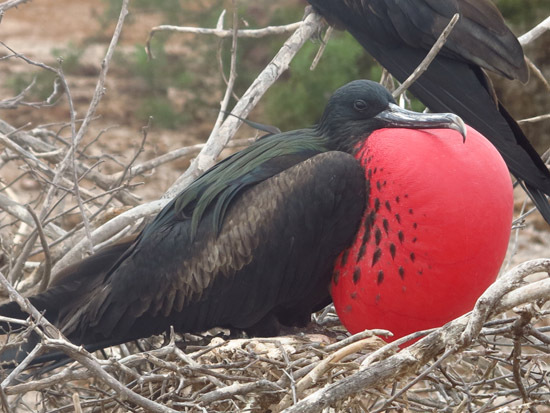 We watched rituals such as frigates inflating their huge, red pouches and blue-footed boobies awkwardly dancing before mating. Beautifully colored fish, sharks, rays, tortoises, and sea lions turned our daily snorkeling excursions into playful episodes. Every day consisted of a morning walk or hike after breakfast followed by fresh fruit juices and snacks, and snorkeling before lunch. Several of the guests relaxed (okay, splashed like little kids) in the hot tub after snorkeling. After a short siesta, we did an afternoon hike, most often on another island. Each evening our guides presented an informational program about what we had just seen and would see the following day, with an emphasis on land conservation and protecting indigenous species. After dinner we were free to enjoy the bar, swap experiences, or lounge on the outside decks looking at the night sky. Since we were kept busy and active, we appreciated whatever downtime we had. Larry and I traveled on a small ship (only 20 guests--with a maximum of 32), which allowed us to explore in friendly, manageable groups of 10. If you want to take children, look for trips specifically designed for families, including on small ships. If you think there won’t be enough onboard amenities to satisfy tweens and teens, consider a larger ship—one carrying 100 plus passengers--although the number of hikes and snorkeling opportunities may be limited. Iguanas populate almost all the Galapagos Islands. Our ship, the MV Evolution is in the background. 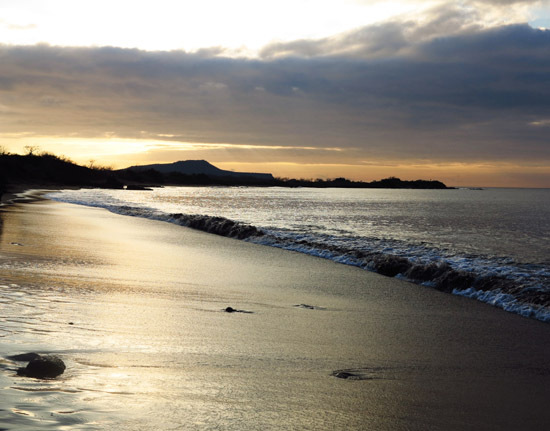 A Galapagos Island adventure is a nature-filled voyage to remote, protected, and sometimes desolate areas. This may not be everyone’s ideal vacation, but if you appreciate seeing wildlife in their natural habitat and experiencing a variety of island topographies, it’s a destination you’ll enjoy exploring. It’s a photographer’s paradise, too, so be sure to bring your camera. The Galapagos Island is a place we would love to take our daughter. How wonderful if she gets the opportunity to see a baby seal as you did. 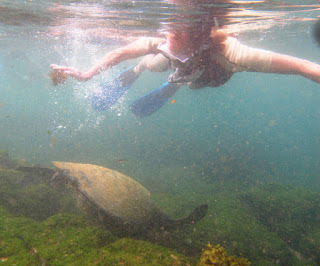 I'm dying to go to the Galapagos and hoping to make it happen this year. So amazing you got to see the newborn sea lion pup! I'd like to do a small cruise too, although I worry about seasickness. Was that a problem on your ship? How lucky! I've always wanted to visit Galapagos! 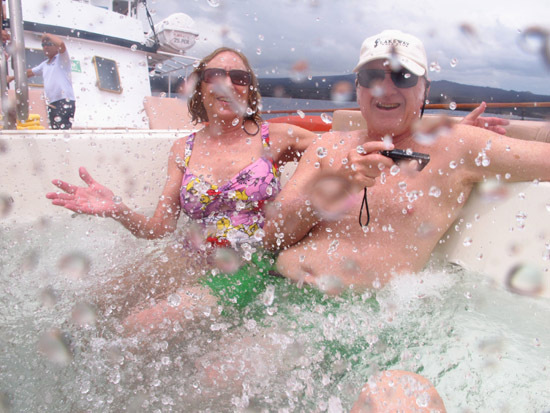 Only one night, when we crossed the equator, did the water get a little rough (not the norm). But then we put down anchor, and when it was time for our morning excursion everyone was okay. 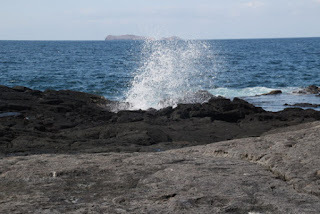 The Galapagos are really a naturalists dream. 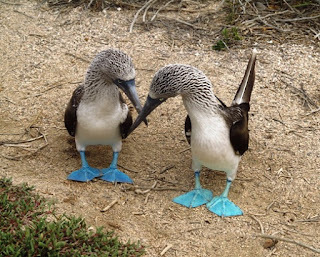 I love those blue-footed guys and the redneck bird. So beautiful. What an amazing experience, while reading your post I could imagine myself there, swimming and appreciating all that stunning nature. The Galapagos Islands are on our bucket list. Looks like you had a great time. Can't wait to get down there and see the amazing animals. Thanks for the great post. The Galapagos Islands are on our bucket list. We are so jealous as it looks like you had a great time with these amazing animals. Great photos! your photos are beautiful, i love the blue footed boobies! the colors are amazing! your intimate tour looks like a great way to see everything! will definitely consider visiting the Galapagos this way! I had to skip the Galapagos, as I had to choose between it and Easter Island the last time I was in the area. This kind of makes me wish I hadn't now! I can't think of anything sweeter than seeing a new born baby sea lion. Galapagos has been on my list for a long time now. You make me very jealous.